I can’t emphasize enough the importance of onions. Based on our traditional recipe the amount of beef and amount of onions needs to be equal. I remember that ever since I was a child this concept sounded really interesting to me - to chop that much onion for only one dish?!? Every time I would walk to our kitchen and see my parents or grandparents crying over the large pot of freshly peeled and chopped onions I knew what was cooking that day - goulash! I always loved that dish but as I child I was a picky eater and I always made sure I picked out all the vegetables out of my plate and ate only meat - and here I am now eating mostly veggies these days - it is funny how these things change! I like my goulash to stay "chunky" because I like to taste all the different textures of vegetables in this dish, however my grandmother likes the sauce to be smooth. To acquire this takes a bit more work. When the goulash is ready she removes all the meat cubes and than she mash the sauce and the large vegetable pieces through the strainer with the fork or just blend the souce with the hand blender. This results in a creamy, velvety sauce that she later mixes with the meat. In the recipe below I followed my "chunky" way of preparing the stew but you are welcomed to try my grandmothers version; it is deliscious especially when prepared with pasta. I love to serve it with polenta (either corn or buckwheat), mash potatoes or a slice of sourdough bread. 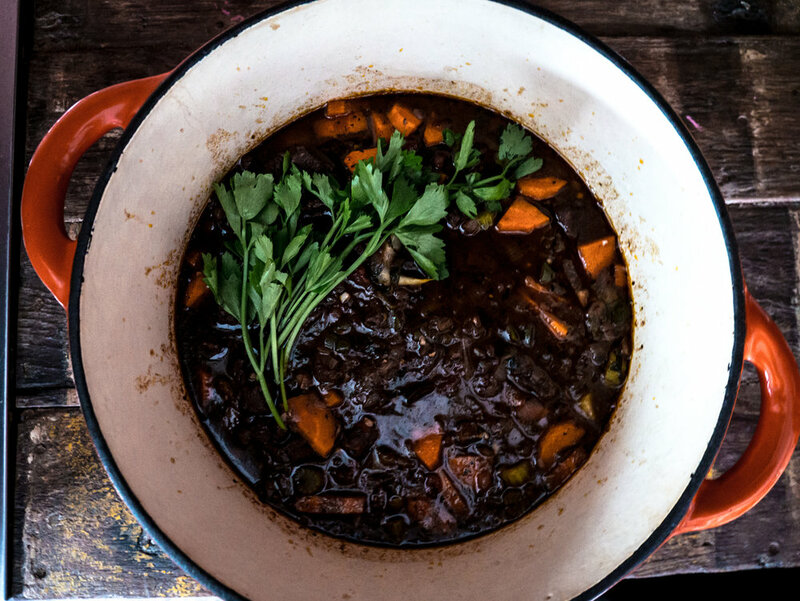 Of course stew like this calls for a glass of hearty and rustic red wine - I would recommend you to try a Syrah from Northern Rhone or perhaps Cabernet Franc from Loire. I do however encourage you try some lesser-known but no less delicious grapes like Plavac Mali from Croatia or Nero d’Avola from Sicily. Bon Appétit! Heat the oil in a pan over the high heat until it is sizzling hot. Add beef cubes into the pan and brown them. Keep sautéing them until they reach nutty brown color. When browned on all sides, transfer beef cubes to a plate or a bowl where they can rest on side. In the same pot with the heat turned down to a medium, add the onions and sauté them for around 10 minutes until they begin to turn translucent and caramelize on edges. Add finely chopped garlic, green pepper, tomatoes (or tomato paste) and paprika and continue to stir for another 2-3 minutes. Add the browned beef cubes back to the rest of the ingredients in a pot and than pour over a cup of red wine and a cup or two of water - just enough so the meat shows from the liquid but isn't completely covered. Stir all the ingredients thoroughly and let them simmer on medium heat for 45min-1h until meat is tender (the length of cooking depends on the meat as well as the pot you are using). Also, goulash is meant to be eaten thick so if your goulash is still “soupy” looking reduce the sauce by lengthening the time of cooking. Make sure you stir constantly to prevent sticking to the bottom of the pot. I like to add carrots and celery to the pot just before goulash is done - this way they stay perfectly tender and remain their color. However, you could add those two ingredients also earlier in the process.